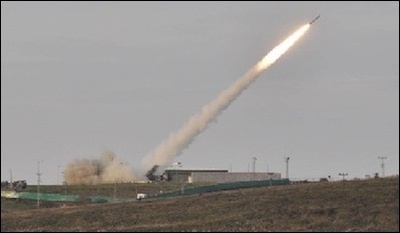 A December 2014 firing test at the Sinop military base in northern Turkey, believed to be the Atmaca anti-ship missile. ANKARA — The Turkish military does not boast the world's most advanced gear for precision strikes, but a number of local programs are progressing, signaling reduced future dependence on foreign systems. Turkish officials recently reported "critical progress" in three systems they have been developing over the past years. Procurement officials said the first critical firing tests for the Atmaca, a Turkish anti-ship missile, went "extremely successful." The Atmaca is a radar-guided anti-ship cruise missile with a range of 120 miles. When the program took off in 2009, the idea was to build an indigenous anti-ship missile "with features similar to the Exocet." But during its development phase Turkish authorities decided that the Atmaca instead should look like the Harpoon Block II, which is already in the Turkish inventory. "There is an understanding that the Atmaca will eventually replace the Harpoon," said one procurement official familiar with the program. The Harpoon is an all-weather, over-the-horizon, anti-ship missile system, developed and manufactured by McDonnell Douglas (now Boeing Defense, Space & Security). It was introduced in 1977. The Harpoon system also has a land-strike variant, the Standoff Land Attack Missile (SLAM). The regular Harpoon uses active radar homing and a low-level, sea-skimming cruise trajectory to improve survivability and lethality. 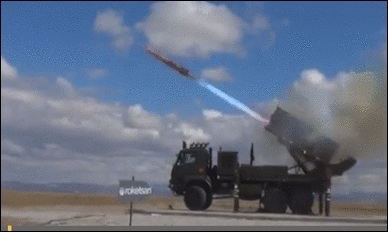 "[A]chieving maximum lethality with minimum cost ... is essential," said a Turkish Navy official. "The Atmaca will help us move forward to our goal of achieving maximum lethality with minimum cost," said one Navy official. "That target is essential for countries like Turkey that have budgetary constraints." An Ankara-based analyst said the military is aiming at a "better and cheaper hit" as the local industry has advanced in several indigenous programs over the past years. "The successful first firing test was a good sign, cementing the military's trust in an industry that is new at developing such capabilities," he said. The procurement official said the first deliveries of the Atmaca will start at the end of 2016. The first Atmacas will be outfitted to Turkey's Milgem corvettes and frigates. The missile system is being developed jointly by Roketsan, a state-controlled missile maker; military specialist Aselsan, Turkey's biggest defense company; and ARMERKOM, an Istanbul-based research and development unit of the Turkish Navy. A firing test of the Hisar-A late last year. Rokestsan announced the first autopilot-controlled test missile of its Hisar-A, a low-altitude air defense missile, was successful in a series of tests June 19-24. Along with the autopilot-controlled test missile, Roketsan said the Hisar-A system's ballistic test missile BTF-2 also was successfully tested. And on July 2-3, Roketsan said, it successfully tested the Umtas, its anti-tank missile. The Umtas, with its infrared imaging and laser-seeker options, is an anti-tank missile with a range of eight kilometers to be used in air-to-ground and ground-to-ground operations. Umtas is considered the official anti-tank system for the T-129 attack helicopters Turkey has developed under license from the Italian-British AgustaWestland and the Anka, Turkey's first locally developed unmanned aircraft. Other potential platforms to be outfitted with the Umtas are armored land vehicles and naval vessels.